Not all baby pools are created equal, and that’s something one can probably say about any product ever to have seen the light of day. Some are made for infants while others are created for toddlers. The design of several can be better than that of various others. The fact is that the baby pool needs to be safe, convenient, and rather durable. Once you’ve covered these requirements, you can check whether it also comes in a nice-looking design. Some of those we have encountered are quite fun to look at as they imitate tiny castles, mushrooms, or anything else that might have crossed your mind. Plus, many are quite budget-friendly, so you should check the following models out. If you’re looking for a new cool toy for your infant or toddler, you can rest assured you found the right one. 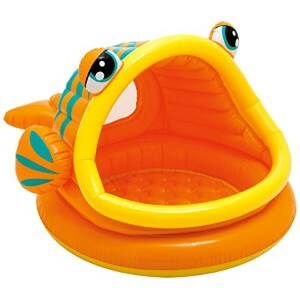 This cool inflatable baby pool features a bright fish design and is intended for children age 1-3 years old. The maximum water capacity is 14 gallons, supported by the 6-inch tall walls. 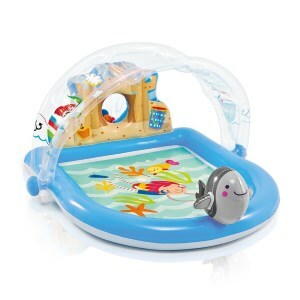 The product is perfect for a lazy afternoon spent in the backyard with your toddler, teaching it killer swimming moves. The item is made from durable plastic, and it is easily inflated manually. The built-in sunshade is a great feature that will partially keep your kid away from the sun so that he or she can enjoy a prolonged bath in the swimming pool. Going camping or on the beach with an infant may not seem like the perfect way to spend a free weekend, but if done right it will mean loads of fun for the entire family. 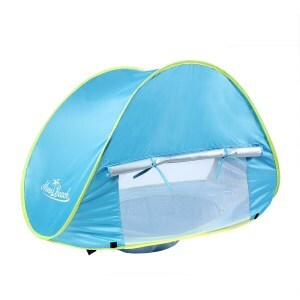 Thanks to this mini tent especially created for the needs of infants, your kid will enjoy the sun and the sand in the privacy of his or her own tent. 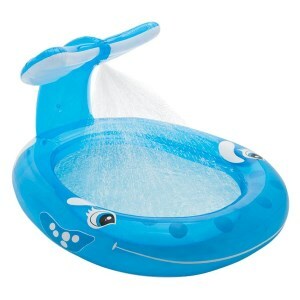 The item was designed for children up to three years old and comes equipped with a mini pool. It provides a moderate UV protection, so it is best to still use sunscreen for your kid’s sensitive skin. 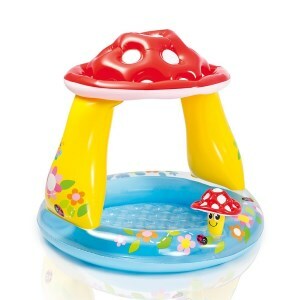 This adorable baby pool features a built-in mushroom sunshade that will keep your child protected from the harmful sun rays all day long. The pool features a soft inflatable suitable for gentle play which will help your infant get used to the water and face its fears. The total water capacity of this play center is 12 gallons, more than enough to help your baby stay cool during hot summer days. The product also comes equipped with a repair patch in case of emergencies and, thanks to its reduced dimensions, it can be easily set up in any corner of your backyard. What better way to keep your baby happy and entertained during the hot summer days if not by allowing him to play in his own private pool? This Intex product features a cool beach-like design and features a removable sunshade, as well as an inflatable dolphin toy sprayer. It is made from durable gauge vinyl, and the total water capacity is 21 gallons. In addition, you will also receive a repairing path and a drain plug. The play center is suitable for older children too, and it can easily accommodate two children, toddlers or babies at the same time. If your kids have a hard time spending their vacation days at home, you can quickly make things more entertaining with the help of this cool spray cool. It features a beautiful whale design and will keep your children safe from the strong sunlight thanks to the large tail. The tail also works as a cooling spray, helping your kids feel like in a real waterpark. The built-in sprayer can be easily plugged into standard garden hoses and provide a cool oasis during the play hours. The pool is intended for children above three years old and represents the perfect mechanism for sibling bonding. Introducing babies to water is a great experience and baby pools are a good way to start. You can get them used to it by using the bathtub, but it’s not as convenient, and you often have less control, and it’s not as fun. Baby pools, instead, are lots of fun and you can use them anywhere you see fit. As the summer season is great for enjoying some outdoor fun with your toddler, a playful afternoon in the backyard is an amazing opportunity, and that’s why most parents look for cool baby pools. The range of products on the market is quite broad, like in the case of most other products destined for babies, and they are very popular. It will not be long before you realize that the task of finding the right baby pool is a bit too much to handle unless you’ve done some research. We can spare you a lot of the useless tab opening and save you some time reading the reviews because we can offer you a guide to make your purchase easier. It includes the factors you need to ease your navigation, and we pinned down the main features of baby pools. Follow these lines and adapt your search according to what you consider catchy and affordable; don’t forget about your baby’s needs. We had to come up with a method so that we wouldn’t waste too much time and still get the best baby pools. We started with the important things and went into more detail until we had the final image sketched in a simple guide. Before you try to find exactly what you picture to be the baby pool that you are after, you should make up your mind about whether you want to buy a pool for indoor use or take it outside. There are a few things you wouldn’t normally put on the list if you want to keep the pool for indoors use. Because most parents have a different placement for indoors in mind, notably as a playground, such products don’t require the same range of features. Most buyers simply need a confined space to place the multitude of toys and give the little ones a well-defined playground. It also keeps the room from getting too messy. It’s better if you want to pick a baby pool that is primarily for outdoor use because it can be turned into an indoors playing space without too much difficulty. Think about the way you want to set up the pool. 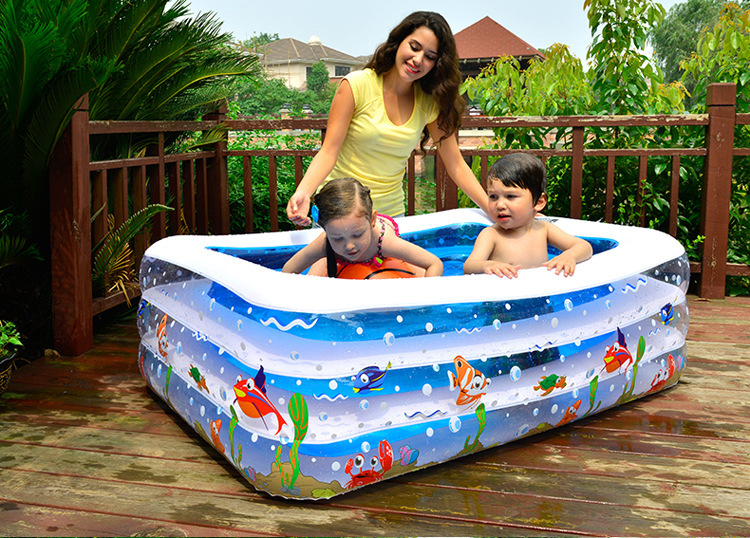 The most common and popular ones are inflatable swimming pools for toddlers. Depending on the brand and size, some of them are easy to inflate, but others require an air pump because it takes a lot of effort and time to blow them up. Note that inflatable pools also have the most various designs, sizes, and options. Pop-up baby pools are also called quick up or easy up pools, and that is more than a hint. They’re not all the same though, because some could need partial inflating. They’re usually not as exciting and have smaller sizes than the inflatable pools. The other models you can find on the market are frame pools. These are not meant for a few minutes of baby playfulness. They have metal frames, more depth, and a bigger size, so they’re a better fit for most kids’ short swim than the toddler splash. Owning and using a baby pool means you’re about to fill some space in the backyard, so you should know just how big you want it to be. The pools with bigger size and higher durability would probably be a good choice if you intend to use them for more than a season. This way, your baby won’t quickly outgrow them. Check to see what their maximum allowed weight is. The technical description might render a weight or a capacity, but whatever it is, you’ll have a better idea of how much water you can put inside and how much blowing up it will require. You can estimate the time it takes to set up, fill, and drain, and the amount of water you’ll use on average. If the size is right and the pool is centered, it’ll have the needed stability. Babies have a habit of jumping around and their liveliness could cause the overturn of a poorly balanced pool. When you look for such details, see that the drainage system is adjusted to the capacity. A small drain means that you have to wait forever until you can clean and pack the baby pool. Other cheaper pools have no drain at all; you’re just supposed to spill the water. Covers and sun shades are also very important. You’re having them sitting in the sun most of the time, so you need some sort of UV protection for longer playtime. To combine efficiency and pure fun, some prefer to search for the best baby pool float with canopy. The covers prove useful when you decide to leave the pool outside because leaves, insects, and dust can transform it into a pond. Baby pools are made of various synthetic materials, like PVC (vinyl), nylon, polyethylene or polyester. They all support a certain degree of elasticity and are enduring when the correct specifications are applied. They also provide easy folding for packing and storage and portability for transportation. There is, however, a worrying piece of information about the health risks brought by the use of PVC, a common construction material for baby pools. It seems VCM, phthalates, and dioxin are carcinogenic and might be released into the environment. There is still a debate about the real or imagined dangers of PVC, but it would be safer to avoid it. Try to buy items that have a protective layer or use other plastics instead. The shapes and colors of baby pools are meant to enhance their looks and you’re about to see ship-shaped or basketball court-shaped pools with inflatable rainbows, slides and cannons and many other design ideas. You’ll also notice pools that have hoses and sprinklers, and that’s an invitation few kids are ready to refuse. Some baby pools also provide inflatable toys and pool floats.